“In remote villages in Africa young girls must miss school each month when they get their periods due to the lack of supplies,” says tribe leader Melissa Allen. “Girls fall behind in classes, and sometimes that leads to dropping out altogether. Eight of Allen’s tribe members accepted the challenge. First they made drawstring bags to hold supplies. Next they’ll make the cloth pads. PFI donated the machines, tools and instruction. The tribe donated materials. The tribe members donated their talent. 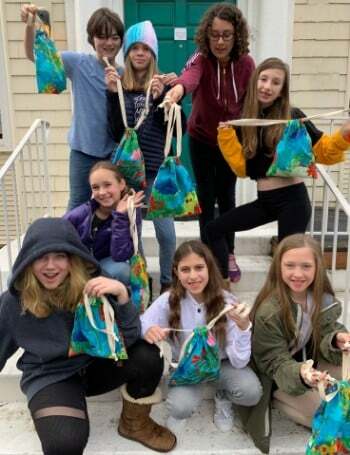 The Happy Girls Tribe is made up of 11-year-old girls “with a goal of building confidence and friendships through experiences together,” Allen says. Tribe members attend Cottonwood School in southwest Portland where Allen teaches art. The Mali Rising Foundation aims to empower the children of Mali, West Africa by expanding and improving educational opportunities for them within their own villages. Another volunteer group, Days for Girls, designed the kit patterns. If you’d like to make your own kit to help the young women of Mali and boost their education, click the pattern and instructions below. To learn more about Mali Rising, click here.